The B2B PR agency, Palamedes PR, has secured hard and digital format exposure for BM Trada, the multi-certification giant, it emerged this morning. 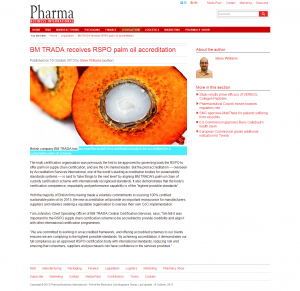 Pharma Business International Magazine published a story about BM Trada becoming the first certification body to be accredited for a sustainable palm oil scheme. You can view the coverage here.